Manchester City's Spanish manager Pep Guardiola says he's in the clear. MANCHESTER City created a shell company for a commercial deal to disguise tens of millions of dollars in income from UEFA investigators, according to club documents cited by a German magazine. Der Spiegel cites internal Man City correspondence to show the team's holding company, state-backed Abu Dhabi United Group, paid the shell firm to "buy" player image rights from the club. Man City would have risked Champions League expulsion in 2014 if a UEFA club finance panel found it had severely breached "Financial Fair Play" rules, which are designed to curb overspending on player costs. Critics say FFP protects storied clubs from ambitious rivals with new and wealthy owners. Der Spiegel is leading the Europe-wide publication of the "Football Leaks" documents. In recent days, European media have detailed plans shaped by Real Madrid for a breakaway European Super League kicking off in 2021, and how FIFA president Gianni Infantino has intervened in its independent ethics committee's work. Der Spiegel also reported last Friday that Man City threatened to destroy UEFA with legal action before reaching a 2014 settlement to forfeit 20 million euros ($22.8 million) in prizemoney. Man City did not dispute the authenticity of the documents, and said an "attempt to damage the club's reputation is organized and clear." Asked about what was reported in Der Spiegel, Man City manager Pep Guardiola said on Tuesday (local time): "Of course I trust the club, what they have done. Of course we want to follow the rules. "UEFA, FIFA and the Premier League, they do what they have to do. "Believe me, I'm completely honest, I don't know what happened, I'm a manager, focused on the pitch, the locker room. 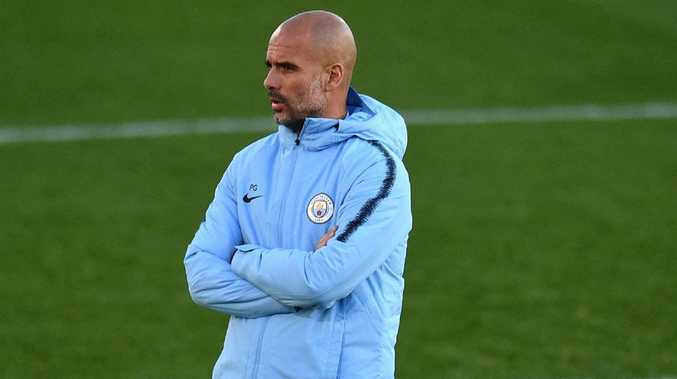 "I'm part of the club, I support the club," added Guardiola, who was speaking at a news conference ahead of City's Champions League match against Shakhtar Donetsk on Wednesday. "We want to do what we have to do in terms of the rules." City achieved this spending more than 1 billion pounds ($1.3 billion) to win a first Premier League title in 2012. This rise coincided with UEFA creating rules - in consultation with the European Club Association - to limit spending within a club's ability to generate revenue. Der Spiegel cited Man City documents in which officials wrote: "Without significant additional revenues ... UEFA FFP compliance WILL NOT be achieved." City CEO Ferran Soriano complained in one memo that ECA members were pushing for the UEFA rules - which many thought could curb the rise of Man City and Qatari-owned Paris Saint-Germain. "We will need to fight this," Soriano wrote, according to the magazine, "and do it in a way that is not visible, or we will be pointed out as the global enemies of football." Man City apparently wanted to shift some costs away from the club and helped set up a shell company called Fordham Sports Management with two British investors. It was supposedly used as a vehicle to disguise payments to players for the right to use their image in marketing campaigns. Der Spiegel said this helped turn almost 30 million euros ($34 million) into revenue instead of a cost, for the purpose of UEFA's investigation of club accounts.